In this season of giving thanks, it’s worth taking a step back from our lives in San Francisco and not only notice just how fortunate many of us in this city are, but also recognize those who made such prosperity possible. To paraphrase Jim Harbaugh, not many people are as lucky as us. The last five years have been trying times for many American families. 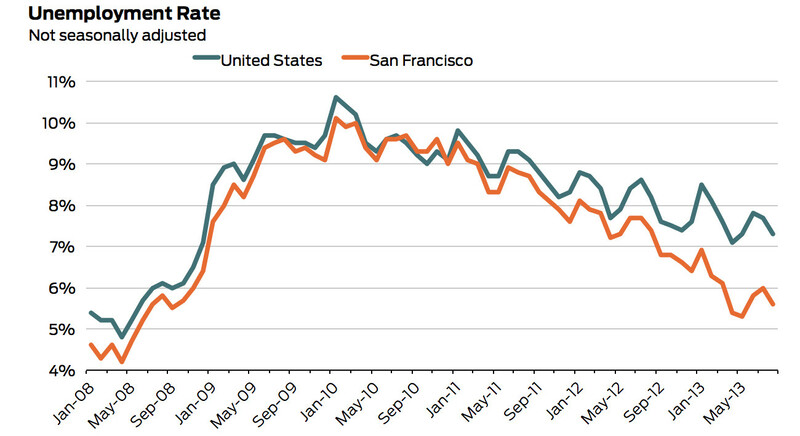 Though the 2008 financial crisis hit San Francisco hard as well, the city made a remarkable comeback. In recent months, unemployment in the city dropped below 6 percent, despite bouncing between 7 and 8 percent in the country as a whole. Young San Franciscans should be especially thankful. Youth unemployment, at 12.3 percent, is considerably lower than the national average of 16 percent. And from an international perspective, things in San Francisco look even better: In the EU, 23 percent of young people are unemployed, and rates are as high as 50 percent in Spain and Greece. Many of us not only have jobs, but have well-paying jobs. At $75,000, 2012 median household incomes in San Francisco were the 4th highest out of 366 metropolitan areas in the country. 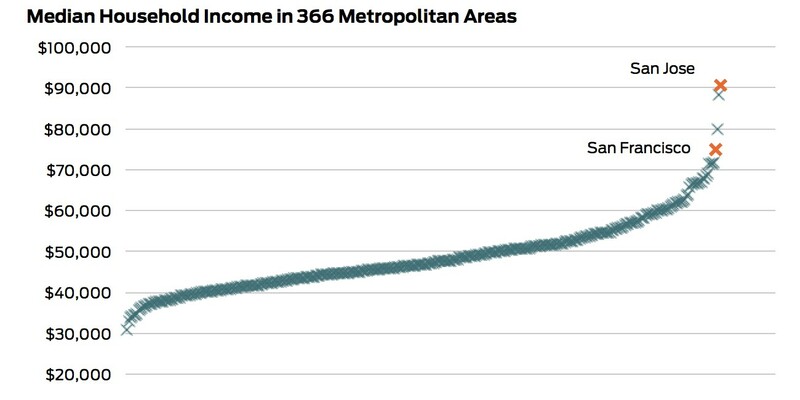 Incomes in San Jose—which eclipsed $90,000—were the highest in the country, and 75 percent higher than the national median of $51,000. But San Franciscans shouldn’t just be grateful for doing well in the United States. There are billions of people in the world for whom even $51,000 would be a fortune. According to the World Bank, 40 percent of the 5.7 billion people living in the developing world—or about 2.3 billion people—live on less than $2 dollars a day. If these people are unable to escape this level of poverty, they would live their entire lives on less than $51,000. In this light, many San Franciscans truly have an embarrassment of riches. As if having well-paying jobs isn’t enough, many San Franciscans have engaging jobs they enjoy. According to Glassdoor, San Francisco and San Jose are home to the most satisfied employees in the 50 largest metropolitan areas in the United States. 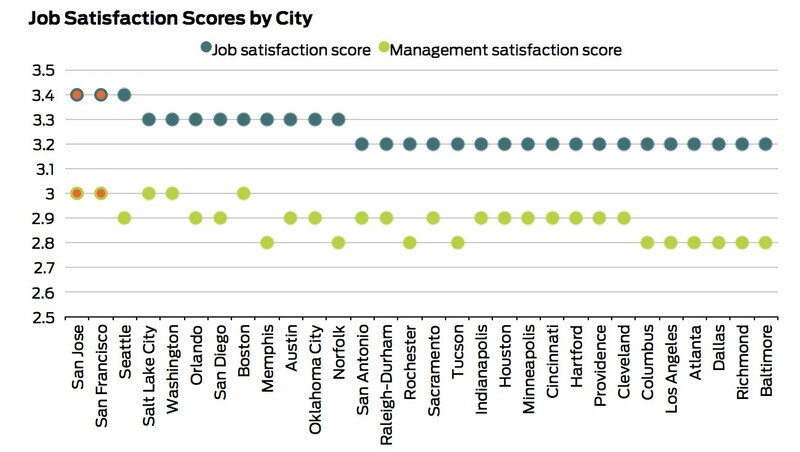 And it’s not just because of the pay: San Francisco and San Jose are tied for the highest management appreciation scores as well. 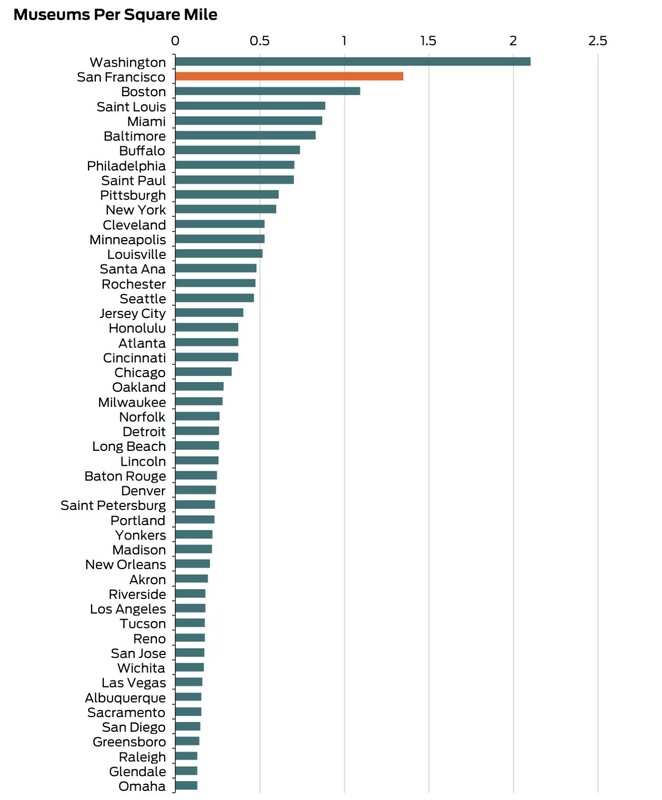 Of course, many people living in the city are much less fortunate than those working in high-paying, satisfying jobs. Many of these people are poor not because they deserve it, but because they caught bad break or were born into unfortunate circumstances. For those born into poverty, San Francisco can offer hope. Out of every 100 people with parents earning incomes in the bottom 20 percent of the U.S. income distribution, 11 are likely to reach the top 20 percent in San Francisco and San Jose. This is the 4th highest number out the 100 largest metropolitan areas in the United States, and 40 percent higher than the U.S. average of 8 people per 100. 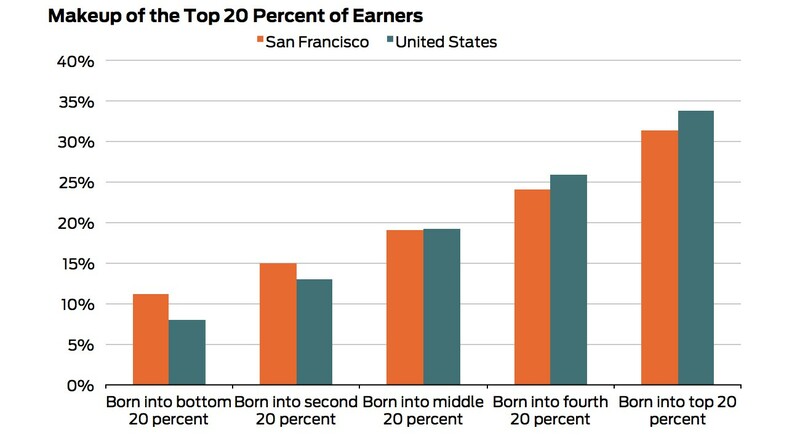 As the chart below shows, the top 20 percent of earners in San Francisco is made up of considerably more people born into poor households—and considerably fewer people born into rich ones—than in the United States as a whole. Nevertheless, this doesn’t mean more can’t be done. Thirty-two percent of San Franciscans born in the bottom 20 percent—many of whom likely help provide the public services that help keep San Francisco running—stay there, meaning the fight for economic mobility is far from over. 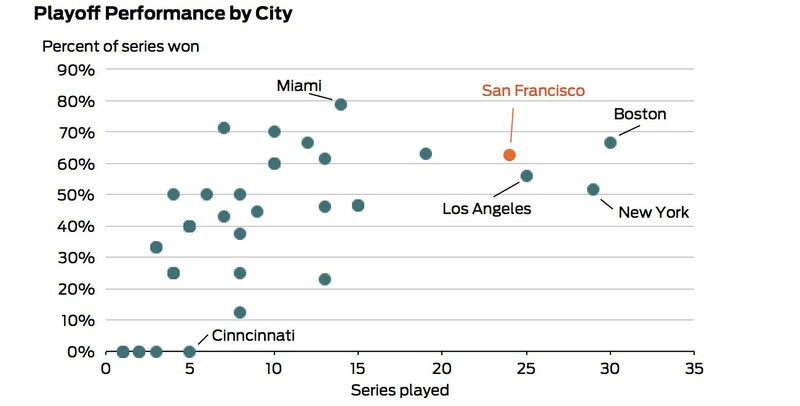 The last several years have been tremendous for San Francisco’s sports teams. Since 2010, the Giants, A’s, 49ers, Warriors, and Sharks have played in 107 playoff games and 24 playoff series. Only New York, Los Angeles, and Boston have played in more games and series, and only Boston (read: not L.A.) has a higher winning percentage in both games and series. Source: Sports-Reference.com. Aggregated data is available in this GitHub folder. Add in the success of Stanford football—three BCS bowl appearances, and two victories—and it’s tough to argue that there’s a better place to be a sports fan than the Bay area. San Francisco’s close proximity to a fault line is often seen as one of its great flaws. However, while the danger of a major earthquake shouldn’t be underestimated, we shouldn’t forget how well we are guarded against them. In 1989, the Loma Prieta earthquake—the last “big one”, a 6.9 on the Richter scale—hit San Francisco, a city of 724,000 people at the time. Tragically, 63 people were killed. Compare that to when similarly-sized earthquakes strike similarly-sized cities in developing countries. In 2010, Haiti’s Port-au-Prince—then home to approximately 900,000 people—was hit by a 7.0 earthquake. At least 46,000 people were killed. By most estimates, the death toll was as high as 150,000 and could have been as high as 300,000. This staggering figure should remind us how lucky we are to live a country that can to afford to protect its citizens against disasters. The graph below shows the average number of people killed in earthquakes in the last 13 years. 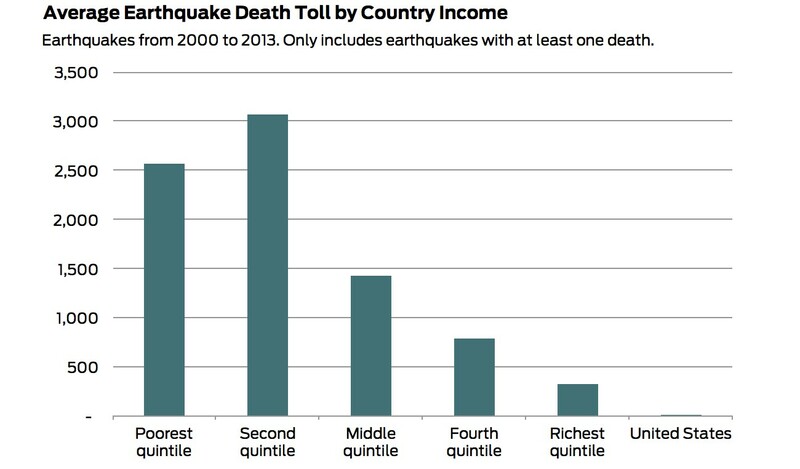 For the poorest 20 percent of countries, an average of 2,500 people die in earthquake disasters. In the richest 20 percent, this figure falls to only 330. And in the United States, it is only 14. San Francisco is not just a city for technology. It’s also a cultural center unlike many places in the world. San Francisco has 63 museums, more than all but 6 cities in the country. This total is even more impressive considering the city’s small size: San Francisco has the second most museums per square mile in the country—behind only Washington, DC, which is home to the Smithsonian—and is one of three cities in the country to have at least one museum per square mile. Though many of us will stay in to eat with our families this Thanksgiving, those of us who choose to go out for dinner have more options—far more options—than residents of any other city. According to Trulia, San Francisco has nearly 40 restaurants per 10,000 households, which is 40 percent more than the second highest city. Add to that a growing fleet of food trucks—and thousands of people willing to get up early and stay up late in order to provide us with menus from all corners of the world at any hour of the day—and no San Franciscan could ever lack for variety. When walking around San Francisco, it’s easy to grow accustomed to seeing people of many different races and nationalities, and from many different backgrounds. But much of the country isn’t this way. According to a recent Brown and Penn State study, San Francisco is the second-most ethnically diverse city in the United States, behind only Vallejo, California. As the chart below shows, the white population in San Francisco is 20 percentage points lower than the overall American population, while its Hispanic and Asian populations are considerably larger. There aren’t many reasons to leave San Francisco. But for those of us who moved from elsewhere in the country or world, Thanksgiving is often one such reason. And in these instances, San Francisco is not selfish. Not only is the Bay area home to three international airports, but these airports are also much less likely to be affected by weather delays during the holiday season than other major airports. 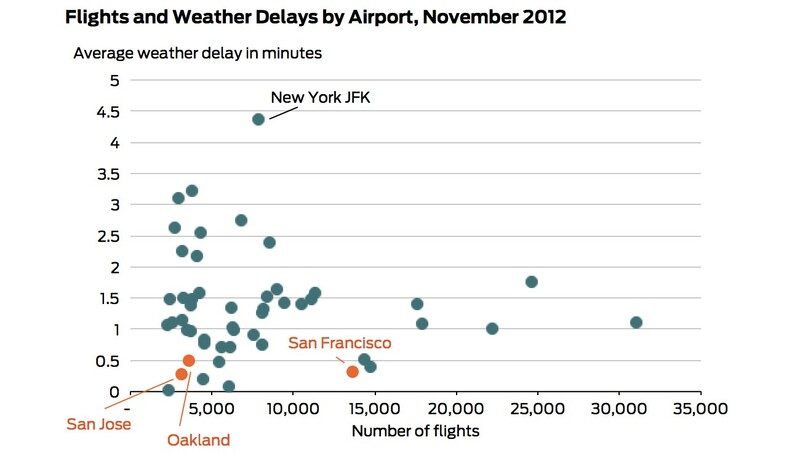 Last November, weather delayed the average flight out of SFO by 20 seconds, Oakland by 30 seconds, and San Jose by 15 seconds. Among the 50 busiest airports in the country, the average delay was 80 seconds. For the reasons above—and countless others not mentioned—we San Franciscans should be thankful. And most of all, we should be thankful for those who, without award or appreciation, have made this city great. Without those who clean and stock offices while we sleep to make sure our jobs are enjoyable, without the underpaid staff working our 2,500 restaurants, without the construction workers who make our buildings safe, without the airline employees who labor tirelessly through the holidays to keep our flights on time, San Francisco would just be any other city. Rather than thanking the good luck of San Francisco for our prosperity, thank them—for it is not the city, but these people and their sacrifices that make our great fortune possible. Data sources are noted below the charts. All the charts can be found in this GitHub folder.